Bangor University has come top in Wales and third in the UK in a new league table which ranks universities on the strength of their student accommodation. 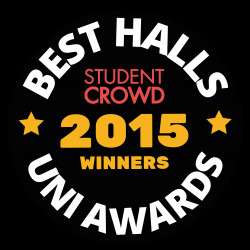 The Best University Awards 2015 by the website studentcrowd.com gave out specific awards to universities who have excelled at giving students the best experience. The winners were chosen by StudentCrowd members who rated the key criteria of their student experience. The guarantee of accommodation for first year students – as well as the quality of the accommodation offered – is a major plus for those who choose to study at Bangor University. All Bangor University owned accommodation now offer free gym membership to the recently refurbished Sports Centre, Canolfan Brailsford which includes a state-of-the-art Lifefitness equipped gym with the latest cardiovascular machines and resistance equipment. Opening in September 2015, the new £30M St Mary’s student village, offers a range of accommodation including en-suite studio apartments and townhouses. There will also be a café bar, shop, laundrette, common rooms and sports and fitness facilities on site. Bangor University’s high quality accommodation was also rated amongst the best in the UK in the whatuni.com awards earlier this year. Guide 2015, a ranking in the top 100 Universities for the University’s international outlook.